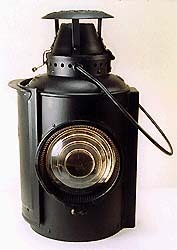 Railroad lamps are distinguished from lanterns by both function and design. Lamps were generally intended to be stationary, were generally made of a sheet metal or cast metal body, and used lenses to amplify light from an interior light source. 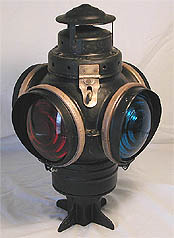 Lanterns were designed to be portable and used globes which were surrounded by a metal frame. 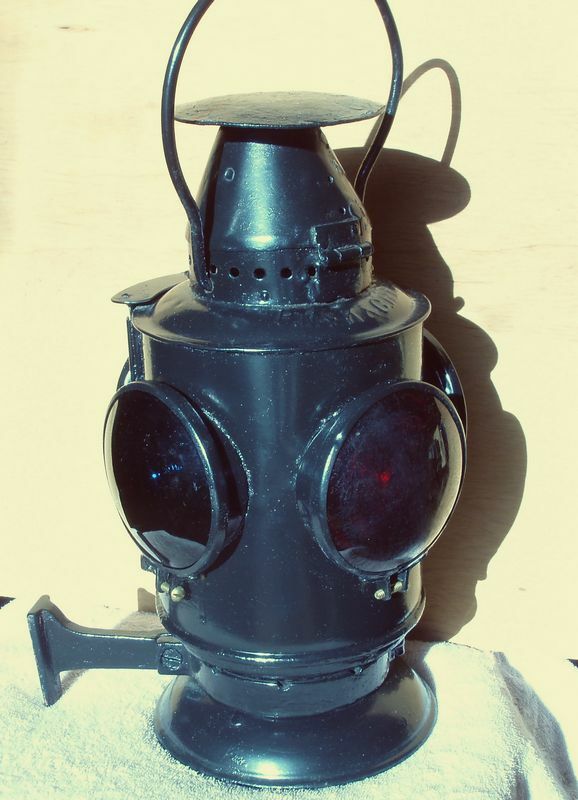 A wide variety of different lamps were used by the railroads, including semaphore lamps, classification lamps, train order lamps, bridge lamps, marker lamps, and switch lamps. 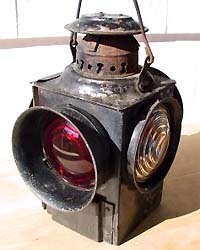 This page provides a brief look at some of major lamp types used by railroads. Note that you can also find pictures of lamps in our historical catalog pages -- see Library -- and a brochure on lamp maintenance. 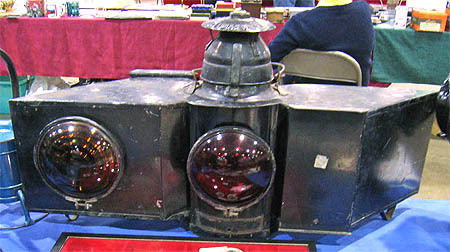 Also see the Railroad Lamps ... More page for more lamp images and information. Above Left. 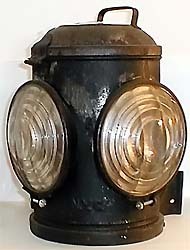 An Adams & Westlake Model #270 marker lamp marked "G.N. Ry." for the Great Northern Railway. 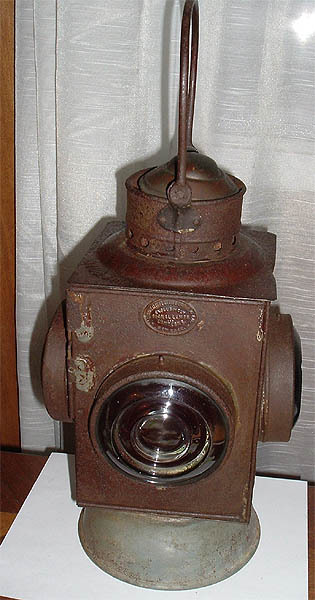 This type of lamp was usually used on the caboose at the rear of the train. Above Center. 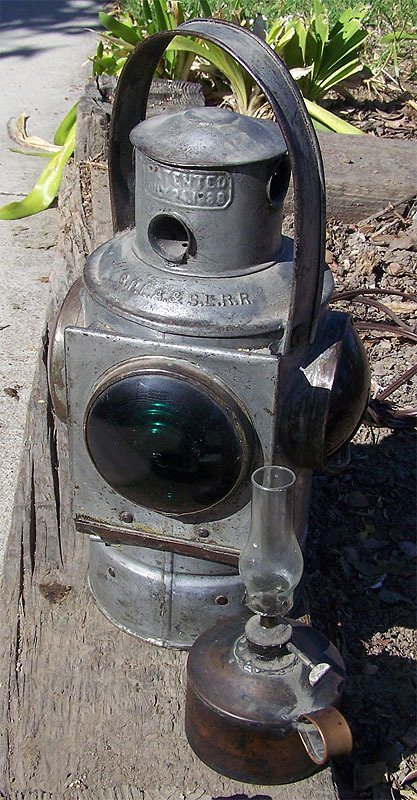 An Adams & Westlake Model #169 switch lamp with a bellbottom base and marked for the Union Pacific Railroad. 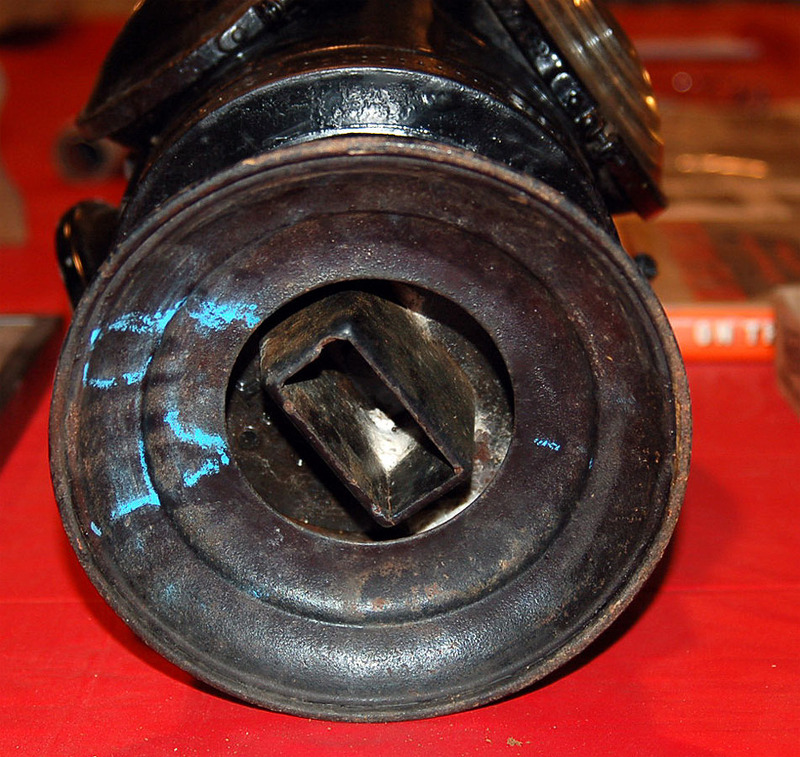 Note the two narrow cylinders coming up from the base, which indicates that this lamp was attached to the switch stand by a "fork mounting". Above Right. 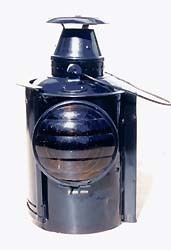 A train order lamp made by Adams & Westlake and marked O.E. Ry. for the Oregon Electric, an interurban operation. 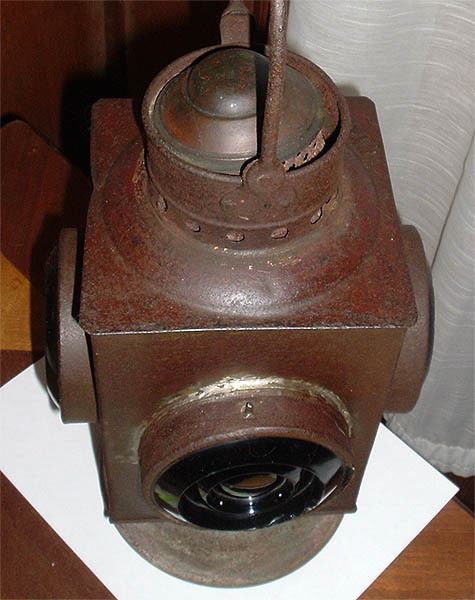 The train order lamp had two lenses on opposite sides of the lamp body. Above Left. 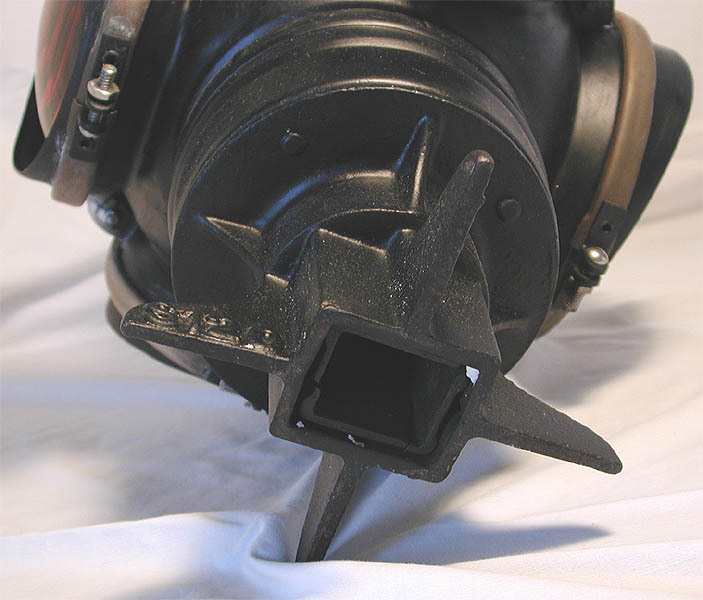 Three images of an Armspear switch lamp. 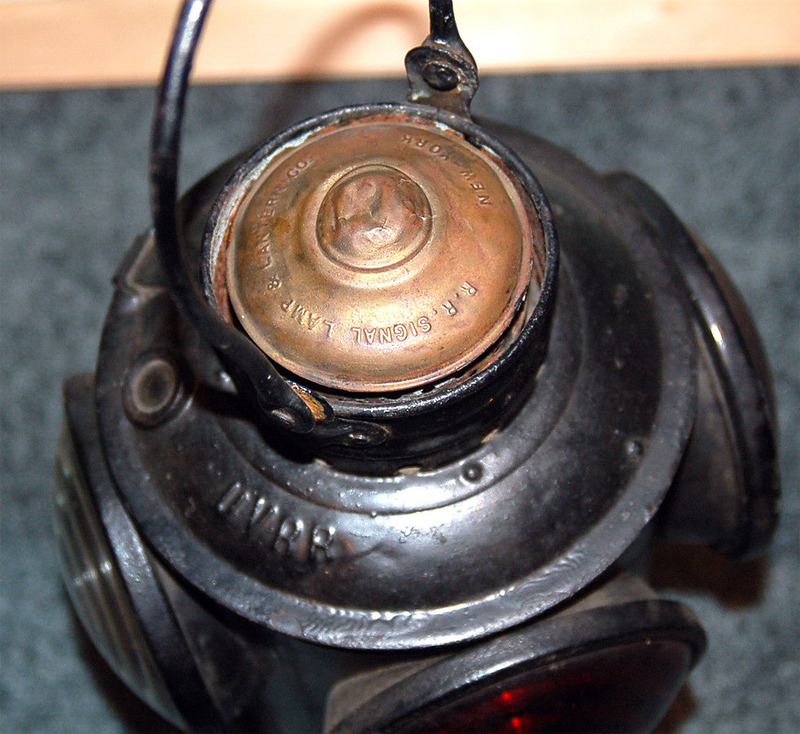 Note the bottom of the lamp -- a spring loaded base for attaching the lamp to a square switch stand post. Click on any of these images for a larger version. Images courtesy of Roma Cox. 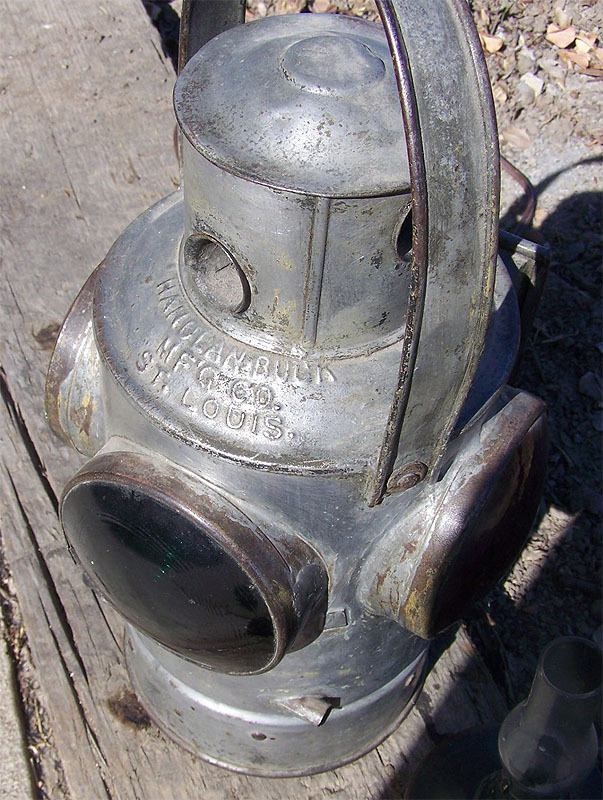 Update on the UP Lamp, far right: A former Canadian Pacific employee emailed us with the following: " I suggest it is probably a Yard Limit sign lamp as ones almost identical to the one pictured were used on the CPR for that purpose. When I was a boy the CPR finally installed block signals on the transcontinental mainline through my home town of Salmon Arm, B.C. and after that the Board of Transport allowed them to remove the oil lamps from the Yard Limit signs but there use continued where there was no block signal system e.g. branch lines, secondary mailines. The Yard Limit sign was a yellow. diamond-shaped sign with "yard limit'" in large letters and a circular hole behind which the single lens yellow lamp was mounted and through which the light shone. It stood on a metal post about head high. Of course the specific style varied from railway to railway." [Thanks to Doug Turner] . Above Left. 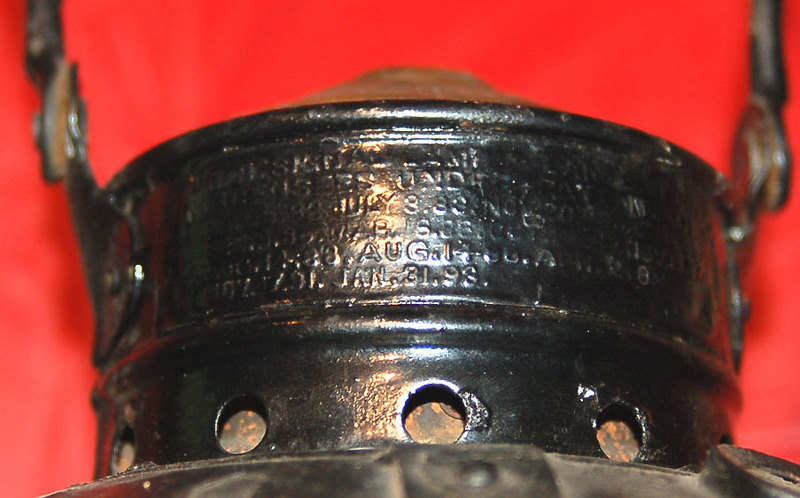 A marker lamp manufactured by Dressel with a tag marked "B.& O. R.R." for the Balitimore & Ohio Railroad. 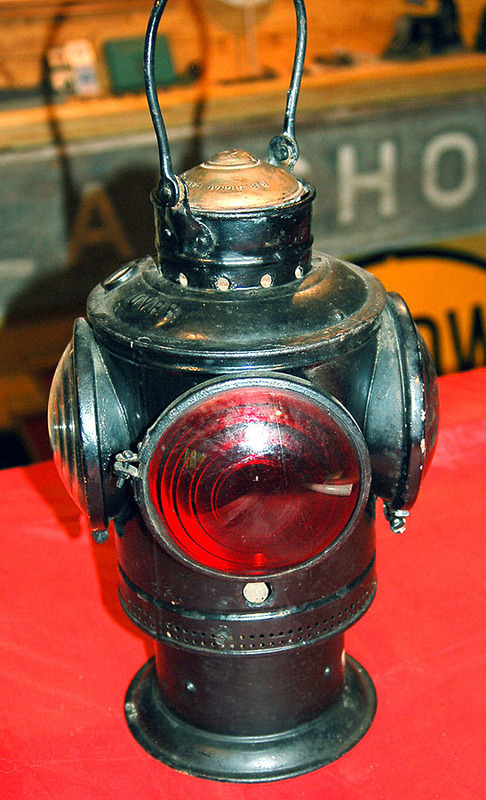 Some railroads painted marker lamps safety yellow rather than the traditional black color. Above Center. 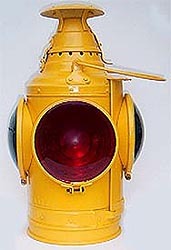 A crossing gate lamp manufactured by Dressel. Photo courtesy of Bill Tarbox. Above Right. 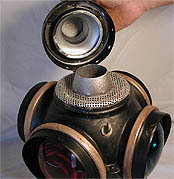 An unusual Canadian Pacific Switch lamp made by Piper. Photo courtesy of Lakeside Antiques, Kaslo, B.C. Above Left. 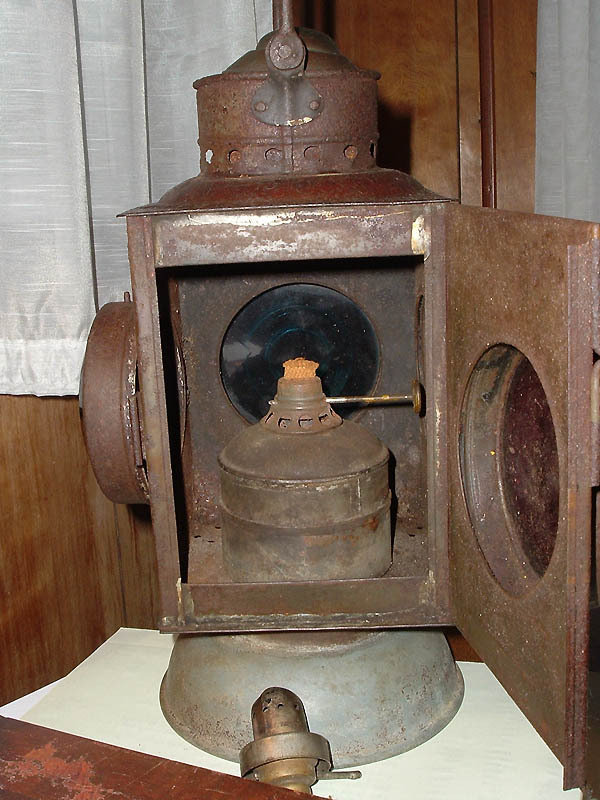 A Fairbanks-Morse engine class lamp marked P&R RR for the Philadelphia & Reading Railroad. Above Center. 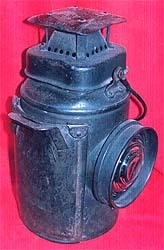 An Adlake 78 or 83 marker lamp marked PMc&C RR for the Pittsburg, McKeesport, & Connelsville Railroad, an interurban line. Both photos courtesy of Don Kosur. Above Right. 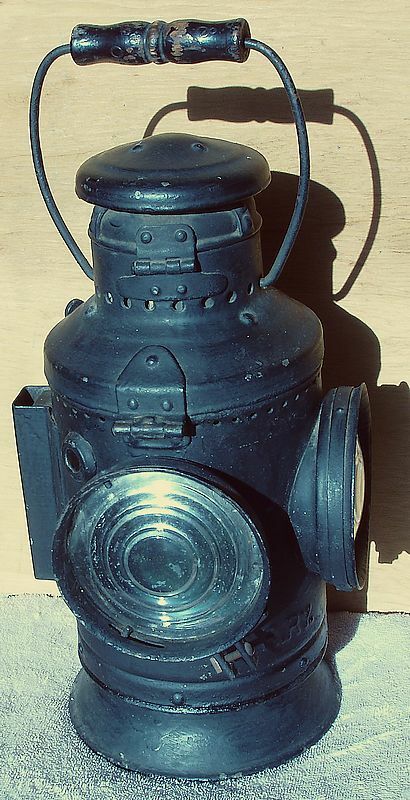 A block station lamp from the Pennsylvania Railroad. Photo courtesy of Rob Hoffer; Click on any image for a larger version. Above. 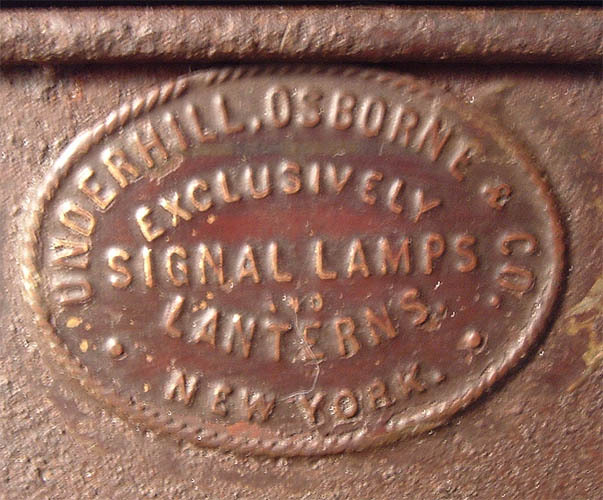 Multiple views of a lamp manufactured by the Underhill & Osborne Signal Lamp Co.for the New York, Ontario & Western Railway. Click on any image for a larger version. Thanks to LR who sent us these images. Left. Two views of a Handlan Buck lamp that was found in a trash dump in Ojai, California many years ago. 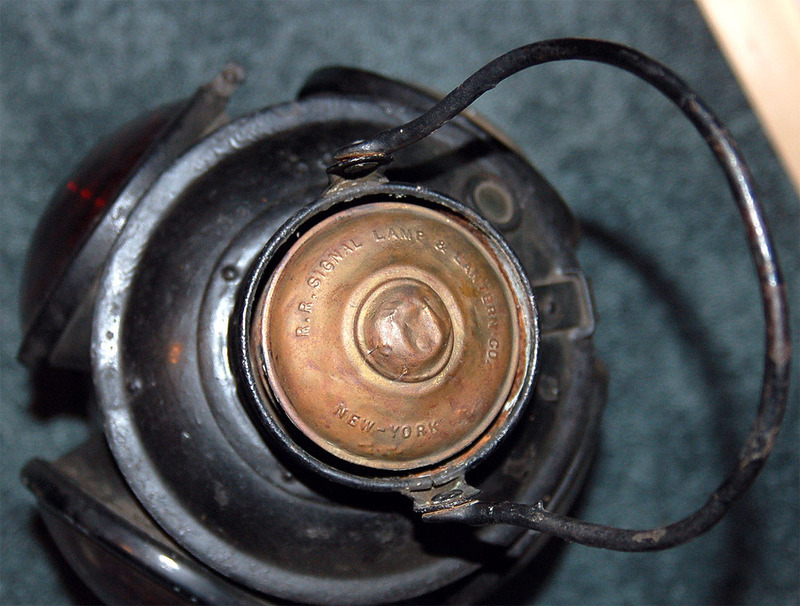 The lamp is marked L.A. S.P.& S.L.R.R. for the Los Angeles, San Pedro & Salt Lake Railroad. 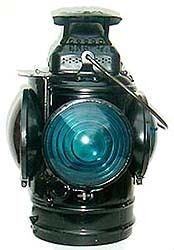 Exactly what type of lamp this is or its use is unclear, but it is certainly rare. Click on any image for a larger version. Above. 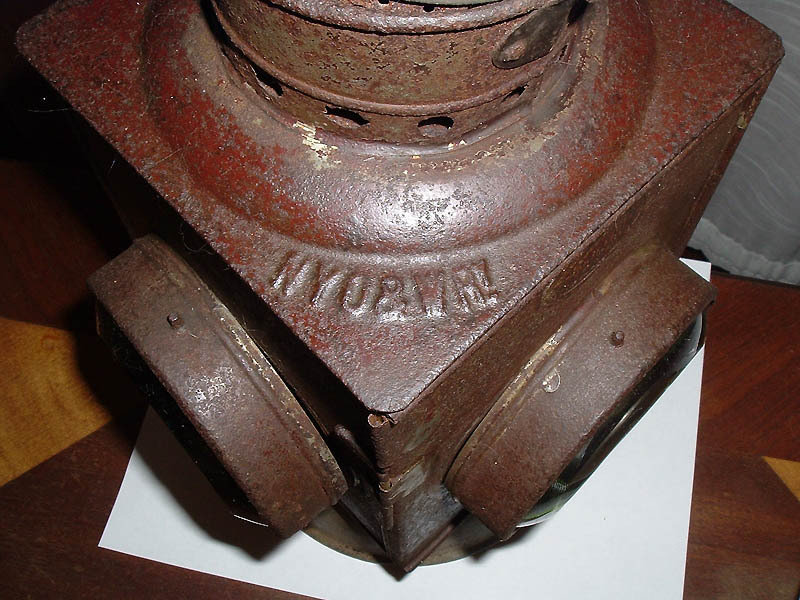 Multiple views of a unusual brass-top lamp manufactured by the Railroad Signal Lamp & Lantern Co.for the Unadilla Valley RR. Click on any image for a larger version. Thanks to JGR who sent us these images. Right. 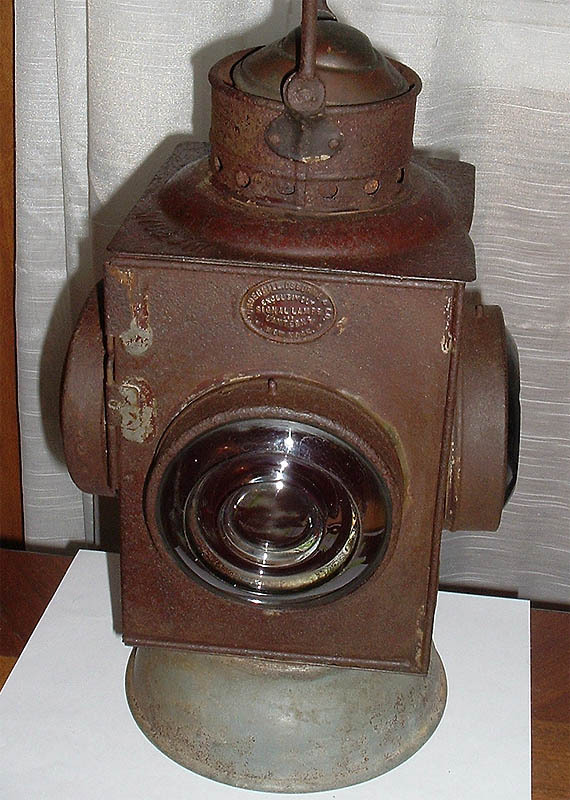 Multiple views of a Caboose lamp made by Dayton Manufacturing Co. Click on the image for a larger version. Thanks to RR who sent us these images.